On Wednesday, November 23, President-elect Donald Trump announced his selection of Betsy DeVos for Secretary of Education. While EdTrust-Midwest does not endorse or oppose political candidates or nominees on the basis of ideology, we are committed to pursuing data-driven policies and evidence-based practices to provide every student with the excellent education that she or he deserves, regardless of race or family income. “As U.S. Secretary of Education, Betsy DeVos will have the opportunity to continue our nation’s upward trajectory by working to ensure that students are given the opportunities they need to succeed academically, and that schools and institutions are responsible for the success of all students. 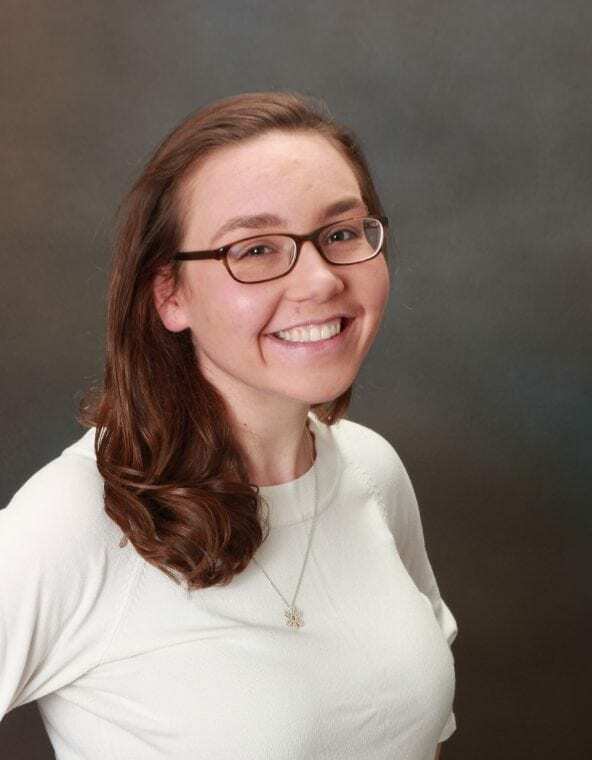 “In this role, she will also have the potential to undermine the nation’s hard-won progress by diverting resources from the young people who most need them, or by failing to uphold the federal government’s responsibility to protecting the needs and interests of all students—especially the most vulnerable. The full text of this blog post is available here. 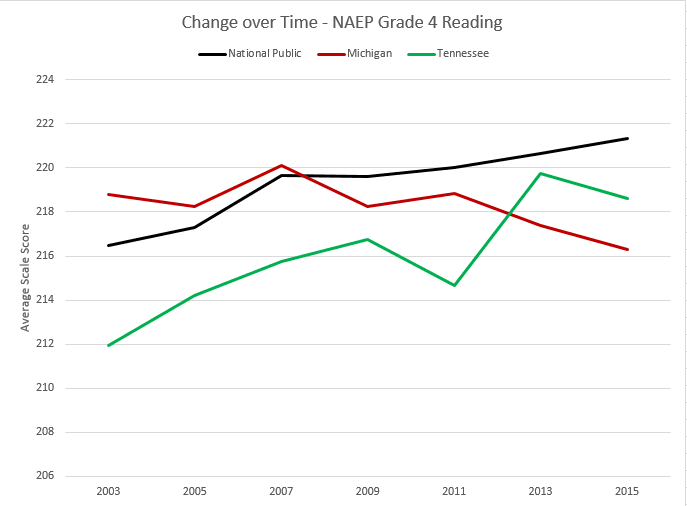 Over the last fifteen years, Michigan’s rank has fallen dramatically in early reading and math student achievement compared to the rest of the country. While the impact is felt across the K-12 spectrum, our most vulnerable students are ultimately most disadvantaged. With nearly half the students in our public K-12 schools identified as economically disadvantaged, it is evident that Michigan will need to shift course – and fast – if the future economic well-being of these students and the state is to be secured. Our low-income students don’t just perform below our higher-income students: they often perform below low-income students in other states. 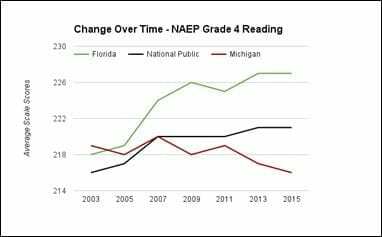 As recent as 2007 Michigan ranked 35th for low-income students nationally, but has since fallen to 45th in fourth-grade reading. Similarly, in eighth-grade math, Michigan is among the bottom five states in the nation for low-income students. Michigan can take a lesson from the experience of leading states to better support our students. In addition to more equitable funding, high expectations for all students need to be in place, equitable access to effective teachers is a must, and accountability for school performance are critical for raising achievement for all students. It will require thoughtful and strategic implementation to move the needle and ensure all students in Michigan are set up for success beyond high school. This week begins the lame duck session of the 98th Michigan Legislature – the period after elections but before recently-elected legislators are sworn in. The lame duck session runs through December 31, although the legislature could choose to adjourn early. Senate Education Committee. Today, November 29 at noon in room 110 of the Farnum Building, Lansing. Agenda: House Bill 5753 (Price – R) regarding requirements for the transportation of students, HB 4265 (Price – R) regarding community college districts, and HB 4136 (Lucido – R) regarding the use of questions from the naturalization test for high school civics credit. Today is #GivingTuesday – a global day of giving back. As a non-profit, the Education Trust-Midwest welcomes donations to help drive non-partisan, data-driven policy research and advocacy for Michigan students. Donations may be sent to The Education Trust-Midwest, 306 S. Washington Ave., Suite 400, Royal Oak, MI 48067. If you have any questions, please reach out to Donnell Green, dgreen@edtrustmidwest.org.